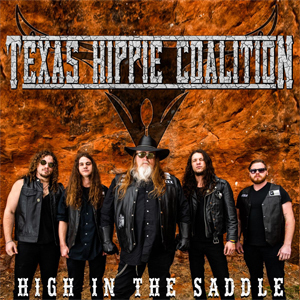 TEXAS HIPPIE COALITION (THC) has released a new song called “Moonshine” today, which is available on all digital platforms. "Moonshine" is also available as an iTunes instant grat track, meaning fans who pre-order the new LP on iTunes will receive the track as an instant download. "When you hear the word moonshine, the first thing that comes to mind is usually a mason jar filled with Grandpa’s creek water," says frontman Big Dad Ritch. "This is a different kind of moonshine." "Many men throughout time have referred to their woman (sweet thang) as their sweet sunshine. Me being a creature of darkness and a lord of the night, I do all my dirty deeds under the moonlight. And when I talk about my baby girl, my sweet thang, I refer to her as my MOONSHINE..."
Album number six kicks off with the alarmingly catchy slither of “Moonshine”. It oozes everything THC stands for and smells like. A true THC manifesto, if ever there was one: swampy grooves, CRUE type partying, and a Man in Black style saga. Backyard barbeques, barroom brawls, tent revivals, and big rock festivals alike are suitable environments for the Red Dirt Metal of THC, a band with a sound so devilishly electrifying that they had to come up with a new genre to describe it. BIG DAD RITCH captains this pirate ship of bikers, outlaws, troubadours, and hellraisers, welcoming all comers to the THC party with gregarious charisma and Southern charm. Across a half dozen albums, countless club gigs, and show-stealing performances at Rockstar Mayhem, THC has spread the good word of big riffs, big hooks, and wild times. "Tell It From The Ground"